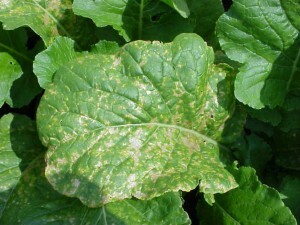 Peppery leaf spot is a common disease of cruciferous plants. The causal agent is Pseudomonas syringae pv. maculicola. This pathogen is seed borne and can overwinter in plant debris and seed. Symptoms begin as tiny water-soaked lesions but coalesce into larger brown lesions with chlorotic halos. 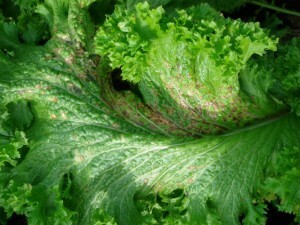 When severely infected, the foliage becomes brittle and dies. In order to prevent introduction of peppery leaf spot into the field, it is very important to begin with certified pathogen-tested seed. Using sound cultural practices, copper-based bactericides and biopesticides can help limit spread of the disease once introduced, but epidemics may develop under persistent conducive environmental conditions (cool, rainy) regardless of inputs. 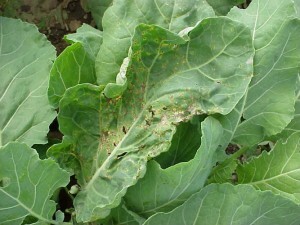 Peppery leaf spot on collard greens (left) and mustard (center; right).